Linda found puppy, Tyson (seen hugging one of our awesome volunteers), in a box in Haight-Ashbury 2 years ago and they’ve been side-by-side ever since. Linda says that Tyson helps control her depression and anxiety. We want to thank you for the ways in which you have supported Street Outreach Services (SOS) and Veterinary Street Outreach Services (Vet SOS) this year. Your contributions and engagement have meant we were able to distribute 3000+ hygiene kits, 4000+ pairs of socks, and give care to over 1000 homeless San Franciscans over the last year. 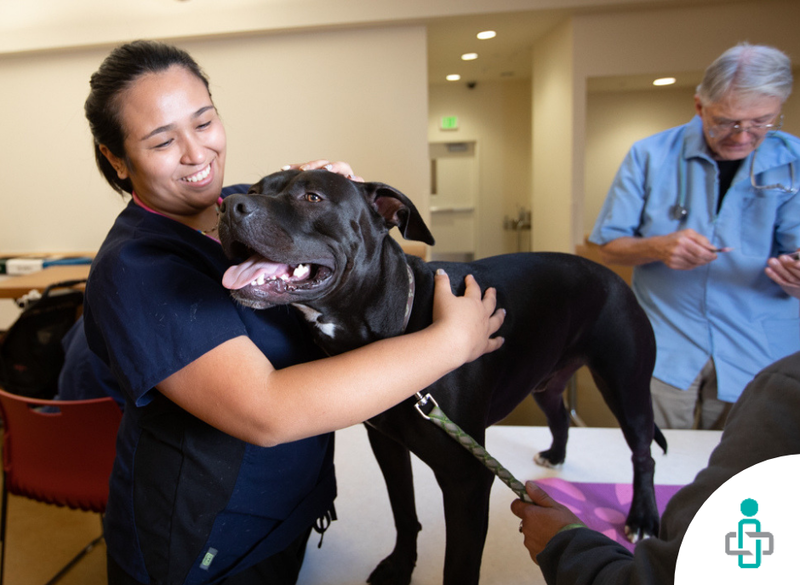 Furthermore, we have been able to make a difference in the lives of homeless San Franciscans’ companion animals by giving over 600 vaccinations, 550+ supplies, 500+ flea medications, and 50+ microchips. Please consider a gift to SOS and Vet SOS so we can continue to serve homeless clients and their pets in 2019. Every donation makes a difference!